Music goes beyond the sum of all notes and lyrics. 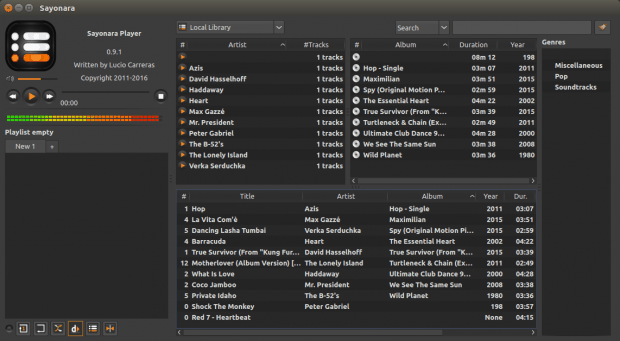 There’s also the presentation layer, and when you are working on a desktop, a Linux one in particular, the digital component of how the music is delivered unto you does count. You want to enjoy your songs with style. As simple as it sounds, nailing the equation is very difficult. 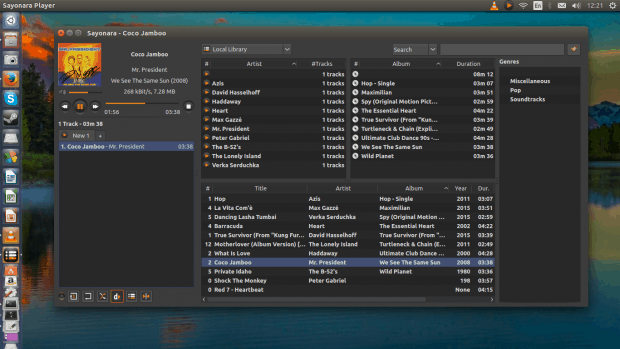 Every few months, a new music player is born, and it promises the ultimate audio experience to its users. Anything from lyrics via cover art to live streaming. 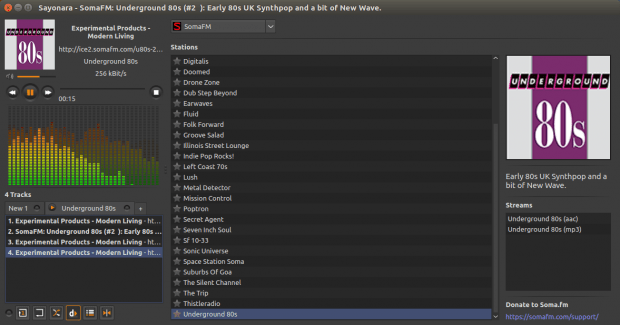 Throw in half a dozen skins and plugins, and you have the perfect juke box. Except, it does not quite work like that. I’ve given the likes of Amarok, Rhythmbox, Clementine, Tomahawk, VLC, and several other players their due attention on many occasions, but now, we need to do it again. Users, say hello to Sayonara. Sayonara, say hello. 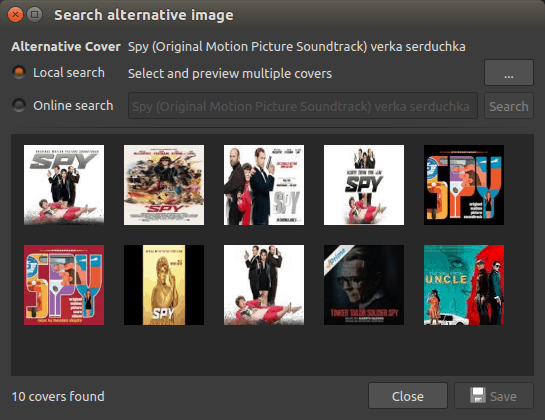 Officially, Sayonara is available for both Ubuntu and Fedora, as well as Megeia, Arch and Gentoo. 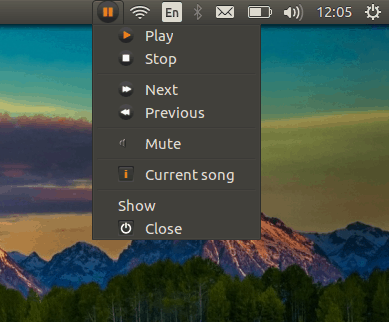 The first requires an extra PPA, but you can also use a smartphone remote control app, whereas Fedora has had the player available in the repos since Version 21 (roughly 10 minutes ago). I tried not to be corny and do a Ubuntu review, like everyone else, so I started with Fedora. It worked fine, except there were several serious visual glitches that prevented me from completing the testing. 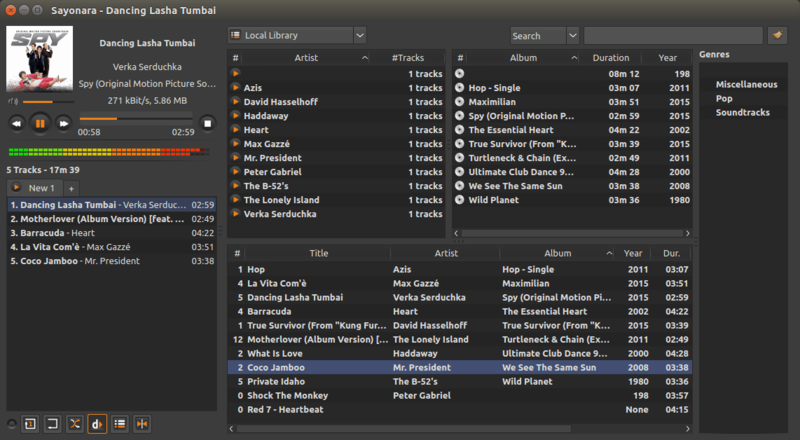 Notably, column titles were all glaring red, where they should be displaying useful text instead, and the vertical alignment slash position of drag-n-dropped songs in the playlist was all wrong. So I switched to Ubuntu and completed the rest of this review with the all-too-familiar Ubuntu window decorations, just like everyone else. Apologies for all the maize. Sayonara works fine. I was a little annoyed by the multi-pane view, and the fact you can spend a good 10 minutes of your life trying to sort out the columns, or the fact that they have this invisible border that renders the horizontal scroll bar when you don’t really expect it. Visually, the layout is decent, but it can definitely be made simpler and more OCD-friendly. I was able to easily add songs and play them. You get what you expect, plus you can also easily change the cover art. If you right-click on any one song, you can check the lyrics, if there are any, and also the metadata for the particular file. I didn’t find a way to auto-retrieve information from the Web. Maybe it happens automatically. Once you start using Sayonara, it’s quite easy to master, and fairly unobtrusive from the look & feel perspective. It is not as natural as some, but it also much easier on the eye than most. However, a spartan design does have its limitations, especially after users get comfortable with the player and start exploring some of the advanced options. The dark theme is a controversial choice. The desktop integration is okay, at least on Ubuntu, and you have the player in the system area. The remote control test will remain on the TODO list for a later time. Sayonara was stable most of the time, although there were a few notable bugs and subsequent crashes. The interface is relatively clean and simple, in some aspect maybe too much, to the detriment of what the player can do or offer the user. The list of sources is fairly slim, and I did not find an easy way to rearrange the layout, get rid of some of the panes, or perhaps skin the program. Maybe these will be added in a future release. Finally, the workflow is good but not as intuitive as it could be, comparing to some other popular Linux music players. Sayonara comes with a bunch of plugins. Some of these offer innocent visualization perks, bells and whistles, while others are more of a functional nature. However, they are not too useful. I am not keen on manually adding streaming URL or podcast addresses or whatever. I would prefer if the player had an option to import directly from websites, discover streams, or better yet, include an inline search option. The player offers SomaFM and SoundCloud, and there’s an option to sign into Last.fm through the preferences window, although I’m not sure how this benefits the user, or where the option is exposed in the player GUI. The two streaming services work, but they aren’t really too exciting. And their presence begs the question: why not include other, juicer and possibly even commercial services, too? One of the menu options reads: Devices. This means you should be able to add your smartphones and whatnot. Well, almost. In my case, iPhone wasn’t detected at all. I had better luck with the Ubuntu Phone, but the discovery was very slow. Then, finally, trying to play songs stored on the phone resulted in what we technically call a bugger. More about this later. The player can be customized, but there isn’t a great deal of flexibility. Nothing like VLC, then again, most people are not looking for an overkill, they just want to be able to play their music with style and flair, with some extras to make the experience a little more enjoyable. All in all, a player with its fair share of settings. Not everything was hunky dory. Any time I checked the lyrics of a song, switched over to the info tab and tried to switch back to the lyrics would make Sayonara hang, freeze and then crash. Reproducible 150% of the time. Going full screen works fine, but there’s no ‘button’ to get you back. You need F11 to restore the view to a standard window. No biggie, but some people might not actually be familiar with this action, and if there’s a menu option to go full-screen, there should be one to unfull it, as well. We can’t ignore the Fedora woes, either, as they sure don’t inspire or add to our confidence. That is actually a rather big one, as I almost gave it a pass. 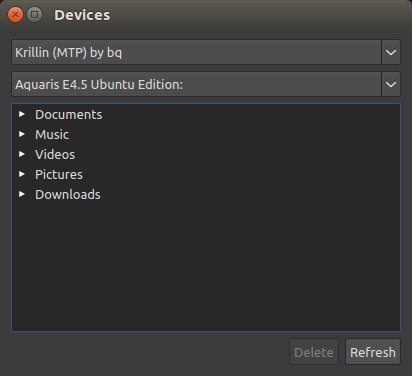 After all, if multiple distros are supported, it should be more than an afterthought. 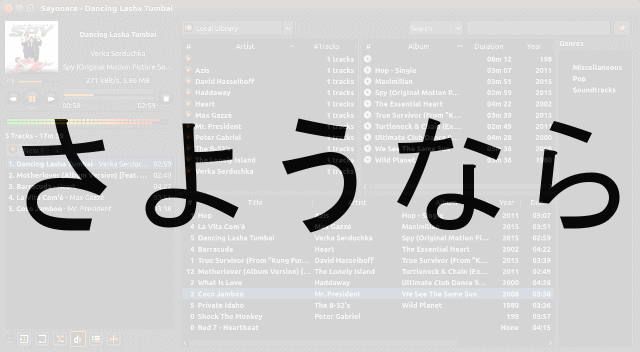 And as mentioned, Sayonara also crashed trying to play music off the Ubuntu Phone through the Devices wizard, but not when right-clicking on a song in a file-manager and selecting Sayonara. Some weird bugs are reigning under the hood, it seems. 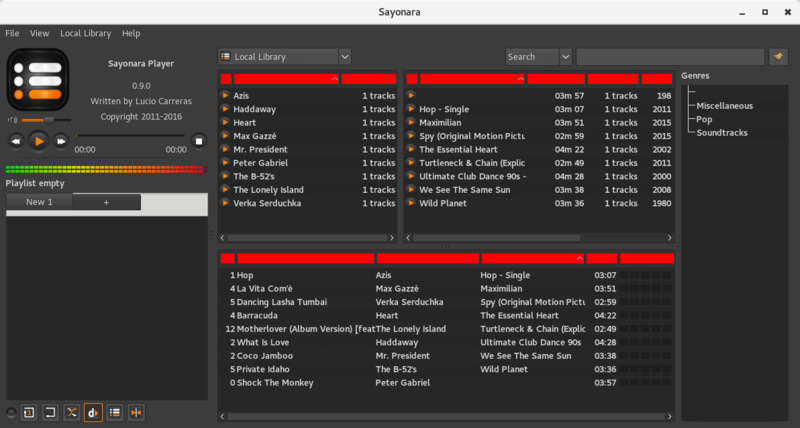 Sayonara launches and plays songs just fine through the file manager, but not when songs are invoked directly through the Devices wizard. There are several other outstanding issues with Sayonara. For example, on the Download page, the developer says: I don’t have an Android or iPhone so there’s no app available. I mean, what. That’s just not professional. Even if you don’t have the right hardware, why advertise it in such a defensive manner? Moreover, this statement highlights the bigger problem with the Linux app ecosystem. It just isn’t integrated or useful enough. Specifically for Sayonara, how about integrating with Google Play or Amazon Music or Apple iTunes or whatever, so that users can seamlessly sync their accounts and collections and use them through the player? 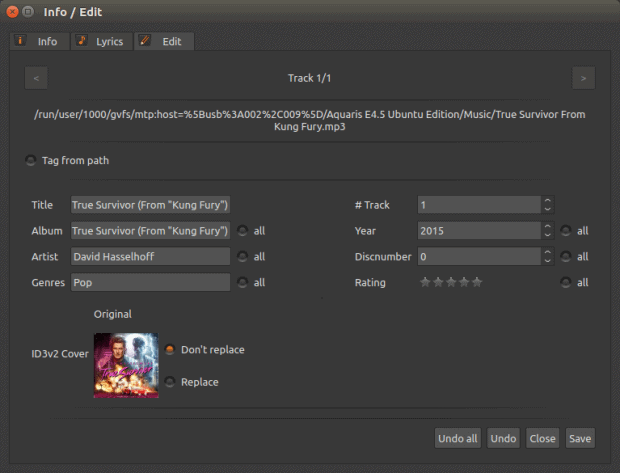 Why not offer users the ability to buy songs from within the player interface, or at the very least sample songs? 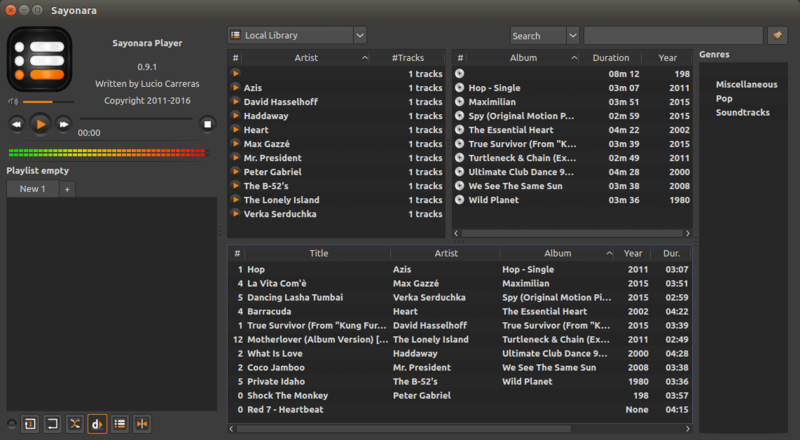 The added value of a standalone player diminishes if it requires half a dozen other programs in order to have a complete music experience. Yes, this is what most desktop users normally practice, but offering more of the same does not really bring any new, added value to this highly saturated field. The likes of VLC and Amarok and friends do the job fairly well. Much like any fresh distro, why would one embrace more of the same, if no existing or new problems are tackled and resolved? And so we go back to square one. And for now, we say goodbye in earnest. September 26, 2016 in Free Culture. ← Open365 mail – You’ve got … something? – Shuffle by album – important, because I have an extensive collection of “classical” music. The music must be able to be played in the “correct” order, and I don’t want to hear successive albums from the same artist. – An extensive streaming capability, so that I can discover new things that I might want to purchase. For right now, Clementine fills the bill (it used to be Banshee, but Banshee has limited streaming capability). I might try Sayonara, but if it takes too much futzing to get what I want, it will go into the trash bin of *my* history. Amarok and Rhythmbox both failed, either from being overly-futzy, or just impossible to get what I wanted. I’ve used a couple of others (since I can’t remember the names, obvious fails, for me). I was very happy to discover your very nice and detailed article. Thank you! Those glitches in the first screenshot should have disappeared with version 0.9.1. The screenshot tells me, that it’s still version 0.9.0. A further update of 0.9.2 with some bugfixes will appear this week. 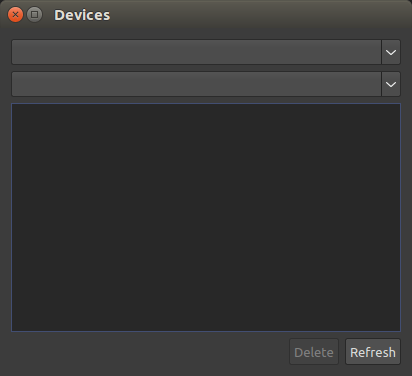 Have you tried out the remote control app with Ubuntu phone? 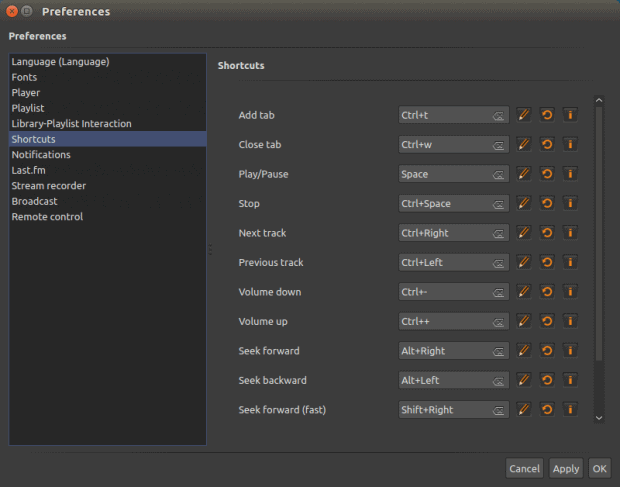 Clementine still reigns supreme among Linux players for me, good design that is easy on the eyes and inobtrusive, offers browsing by folders which is a very very important feature for me, has music transcoding, playback controls on the icon in Unity, lots of online services, lyrics, it is not crowded with panels like many other players, everything is just the way it should be and I can find and play my music quickly.